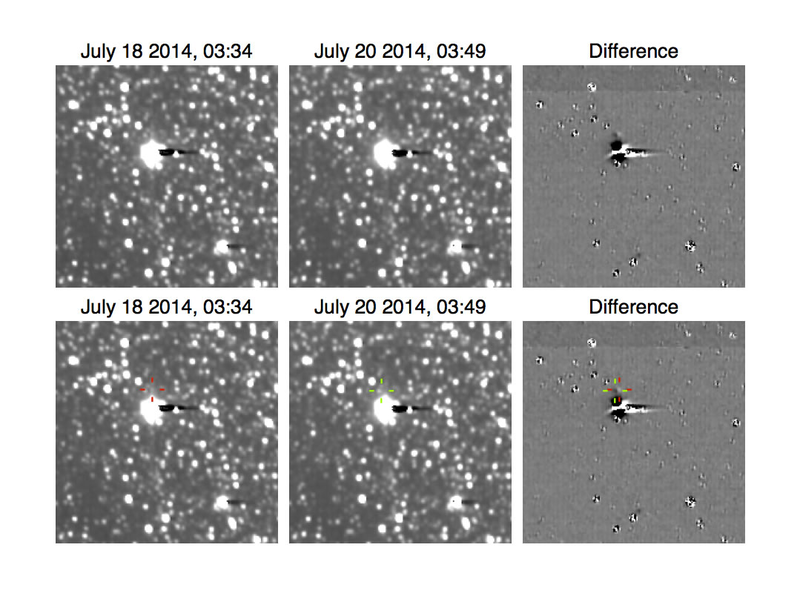 Using its Long Range Reconnaissance Imager (LORRI), New Horizons made its first detection of Pluto's small, faint, outermost known moon, Hydra. 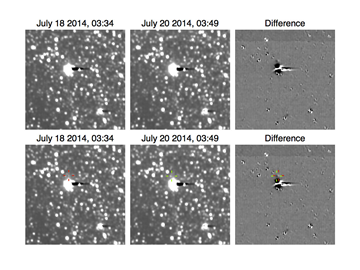 The images were taken to practice the long-exposure mosaics that the New Horizons team will use to search for additional moons and potentially hazardous debris near Pluto as the spacecraft approaches the Pluto system in May and June 2015. Analysis of those images in September by Science Team members John Spencer, of the Southwest Research Institute, and Hal Weaver, of the Johns Hopkins Applied Physics Laboratory, revealed Hydra —a moon the mission didn't expect to detect until next January, when New Horizons will be about twice as close as it was in July. To detect Hydra, New Horizons took 48, 10-second images of Pluto on July 18 and again on July 20; the team combined half of them (which offered the best views of Hydra) to produce the very sensitive images on the dates shown. Pluto is the bright overexposed blob near the center of the image – the dark streak emerging to the right is a camera artifact caused by the intentional overexposure. The images on the two dates appear almost identical, but the difference between them is shown on the right. This "difference" image removes the crowded background of stars that doesn't change between images. Hydra, which has moved over the two days, is revealed as an overlapping pair of bright and dark spots just above Pluto. The bottom row shows the same images with Hydra's expected position on the two dates, identified in each image by the red and green crosshairs. Hydra's motion can just be seen at the expected location in the original images. Pluto's next-brightest small moon, Nix, is closer to Pluto and cannot yet be separated from Pluto's glare. "I'm excited about this first detection of Hydra," says Principal Investigator Alan Stern, of the Southwest Research Institute. "It came as a bit of a bonus from this summer's spacecraft activities." The processing tools used to combine the images and look for moving targets are the same ones that the team will use to search for much smaller "new" moons when New Horizons is much closer to Pluto. New Horizons was still 267 million miles (430 million kilometers) from Pluto when the pictures were taken, and the fact that it can already see Hydra was an encouraging test of the team's ability to find faint moons on the final approach to Pluto. "Using those techniques, Hydra popped right out of the data, though it's still very faint – several times fainter than the faintest objects the New Horizons camera was designed to detect – and still very close to Pluto," Spencer says. "We're thrilled to see it, because it shows that our satellite-search techniques work, and that our camera is operating superbly. But it's also exciting just to see a third member of the Pluto system come into view, as proof that we're almost there!"